located in Sialkot(Pakistan), we have garnered wide appreciation with our professional behavior and affordable prices. We cater to the personalized packaging requirements of the clients. We make use of premium packing material for ensuring the safety of the products during handling, warehousing, and transportation. 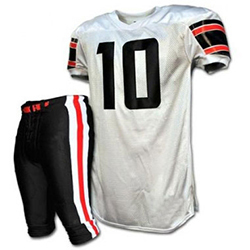 WB-1609 American Football Uniform is made of the finest quality fabric and is available in different color options.